As the harvest has progressed, it has become increasingly apparent that the 2018 Crop will not approach 2.45 billion lbs. It may be modestly larger than the 2017 Crop, with 2.3 billion lbs looking like an over/under number that will evenly split bets. Entering harvest, there were two factors dampening the enthusiasm for locking in commitments. One concern was the potential impact of trade issues and tariffs and the second was a potentially larger crop. Growers were skeptical of the NASS Estimate after living through record freezing temperatures during early bloom. Buyers had no reason to doubt the NASS Estimate. The differences in outlook created confusion and delayed commitments well into the harvest. However, there was never any reason to believe that consumer demand was not continuing to grow. With the October Position Report, the uncertainty is beginning to dissipate. Shipments exceeded last year’s record number, a bit of an upside surprise although consistent with the steady business occurring throughout the month. October commitments of 277 million lbs were also an upside surprise. During the month, increases in shipments to the U.S. and E.U. more than made up for modest softness in shipments to China and the Middle East. With trade issues being navigated and an overall supply that is now seen as the same as last year, we are likely to see similar shortages in pollenizers as were experienced in the late season last year. With trade issues being navigated and an overall supply that is no more than last year, we should see firm prices in the short term. Current price levels are historically moderate and may also rise as supply tightens in the latter months of the crop year. 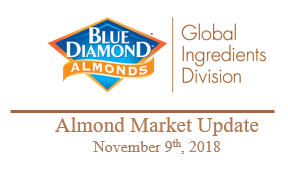 Ingredient users of almonds may find the best buying opportunities were found in October, as the outlook is becoming more stable for 2018 supply vs, demand.